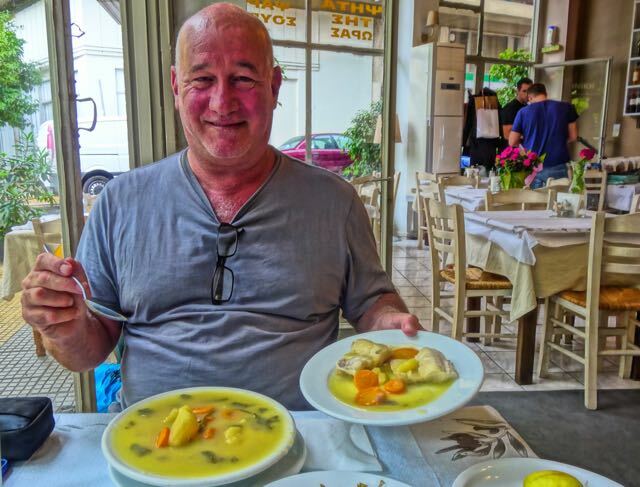 As I mentioned on the Fokionos Negri page, the first restaurant you visit should be O Bakalogatos because not only is it the best restaurant in the neighborhood, it may be the best in all of Athens as some of the most well known chefs who eat there would agree. They have a large menu, in Greek and in English, and the staff does speak English. Order the mussels, either from Limnos, or Mytilini which come in a delicious broth suitable for dunking their whole wheat bread and paximadia. Save some for their white taramasalata which will make you forget the pink stuff. Order the makaronades with cheese and crispy onions, order the pasta with shrimp, order the sausage, order the sikotaria (liver and stuff in wine sauce), order the best dolmadakia (stuffed grape leaves) you have ever eaten, the grilled vegetables are amazing, the Kykladiki salad, or any of the meat dishes. I could go on but start with these and then ask the waiter or owner to suggest something. Oh, and save room for desert, especially the chocolate soufle with home made ice-cream. The chef-owner is Giorgos Kantelis, disciple of Panayotis Papanicholaou, who is as close as you can get to being a genius in Greek cooking, drawing his inspiration from traditional dishes from all over Greece as well as the years he spent in Chicago. Pick an island and there is probably a dish from there. You could eat here every night and never grow tired of it and come away with a whole new understanding of the depth of Greek cuisine. If I had the money I would take this restaurant and move it to my town in the USA or even in New York, because this is how modern Greek cuisine should be done. Great selection of good tsipuro, raki and ouzo as well as nice local wines by the carafe and fancier stuff by the bottle. Try the organic tsipuro from Limnos. They have also added some Greek micro-brews. Bakalogatos is at #72 Fokionos Negri and you can call +302108216598 or visit their Facebook page. I eat here as often as I can. For those of you who are traveling on a budget or live in Athens and want to go out to dinner regularly and not spend much more than what it would cost to eat at home there is a terrific choice and though it is off the beaten path you can easily have a nice meal here for under ten euros whether you come for lunch or dinner. The restaurant is called H Nostimies tis Mary's and it is a family run restaurant that serves Greek traditional food that is as close as you will find to village or island home-cooking. Run by the lovely Mary, with lots of help from her mother, her husband Christos and her three sons, Nikos, Lefteris and Giorgos, who wait tables and deliver take-out, the clientele are a Kypseli mixture of working-class, poets, artists, pensioners, businessmen, famous actresses and people looking for large portions for prices that are a notch or two above a soup kitchen. I eat lunch here almost every day that I am working at home. They also make their own pizza and pasta dishes. Mary makes the best bakaliaro with skordalia I have ever eaten and the best fish soup. Great everyday restaurant if you need one. Actually with places like Mary's it seems silly to go through the trouble of cooking and eating at home. For 10 euros I can have a two course dinner with wine. I also want to recommend both her tiropita and her spanakopita which are large and filling. Order those for lunch along with a horiatiki salata or some vleeta or whatever other seasonal greens she is serving and you will probably be fine until dinner. Or try her aginares (artichokes) and potatoes. At night time they serve grilled meats too. 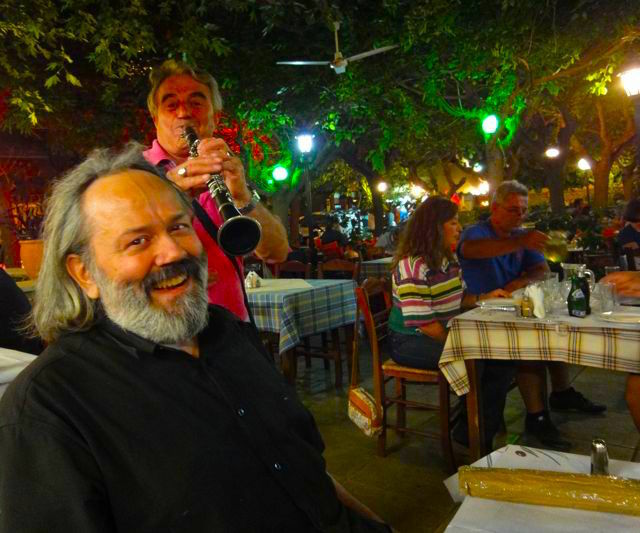 The restaurant is in Platia Agios Giorgiou which is where Ithakis, Eptanisiou and Ydras streets all converge. You can also order by phone and they will deliver: 210 8229239. 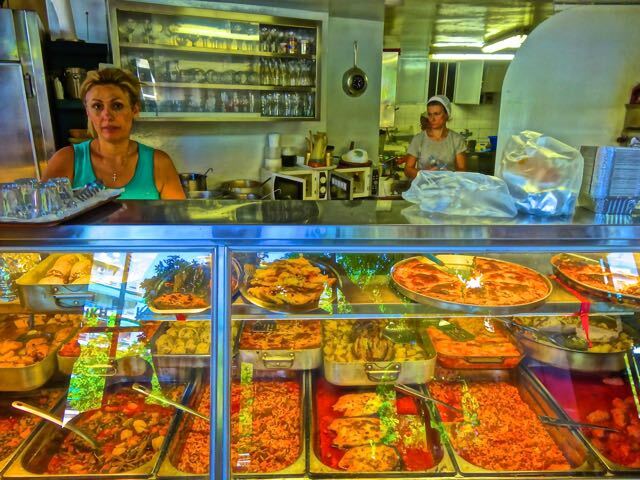 But really you should come in because all the food is on display in Greek estiatorion style and it all looks so good you probably won't know what to get. The small square (a circle actually) in front of the Agios Giorgiou church is an interesting one, sort of a village within a village with a couple psistaria-souvlaki shops, a mezedopouleion, a beautiful bar, an old-man cafeneon and a Dodoni ice-cream shop and maybe the best zacharo-plasteion in Kypseli. Afterwards go next door to Allotino Jazz Cafe for drinks or coffee. Or go there before dinner for a beer, wine or probably the best top shelf liquor you will find anywhere. Andreas is a connoisseur of fine wines, beers and liquor and searches far and wide for the best. He also serves snacks and salads with his drinks. Allotino is right next door to Oi Nostimies tis Mary's and they both have tables and chairs across the street in the square. Another great restaurant is Kybeli, right across the street from Allotino. It is a traditional, yet modern mezedopouleion-ouzeri with an extensive menu and a friendly, young English speaking staff. They have tables and chairs in the square as well and an air-conditioned interior for those extra hot summer days. Across Fokionos on a tiny street called Xanthis which is just a block long and connects Lelas Kardiayianni and Tenedou streets is an old cava called H Pigi Tou Dionysou (The Spring of Dionysious). 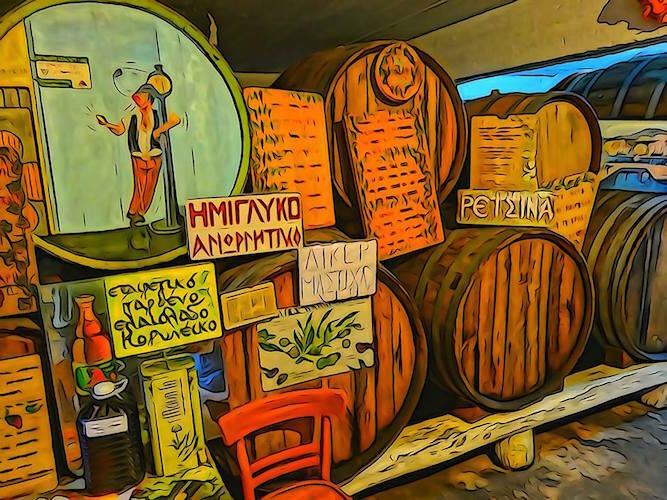 Their retsina is excellent, and as many people have noticed, now that Greece has become a respected exporter of bottled wine, finding good retsina is like.... well, finding a good taverna actually. This cava is certainly worth stopping in to stock up if you are in the neighborhood and some of their wines are worth going out of your way for. If you want to walk a little farther go up Agia Zoni, another pedestrian street that starts near the middle of Fokionos Negri and you will pass several ouzeries and souvlaki shops as well as a mental asylum and the famous church of which the street is named, before you come to a small square called Platia Platanos where there is an excellent neighborhood taverna called of course Platanos Taverna, as well as a nice tsipuradiko called Zaragana right next door. The action is indoors in the winter but when the warm months begin the tables and chairs on the platia give you that island feeling in the middle of Athens, or sort of like Plaka but without the tourists and better food, the way it used to be. Platanos was recently sold and is now more of a traditional yet modern Greek restaurant, similar to Bakalogatos with lots of interesting mezedes and large servings. Order the mixed grill, Sardelles Pandremenos, Mussels Saganaki (which is more like a big bowl of fresh mussels than any saganaki you have ever had. Both restaurants are worth the walk, or taxi ride or whatever if you are looking for authentic Greek food. At Zaragana try the grilled sardines or the marinated gavros which both go nicely with tsipuro or ouzo. If you take a taxi tell the driver Agia Zoni and Odos Kalifronia. Platanos, like Bakalogatos, is in my Top-12 Restaurants in Athens page. If you are looking for a fish taverna and can live without a view of the sea the popular fish restaurant Blasis Psaradiko-Psarafago on Fokionos Negri is a combination fish market/fish restaurant with a great concept. You buy the fish by the kilo and you pay them to cook it. They also have salads, vegetables and even some meat dishes and a variety of tsipuro and ouzos. The waiters are friendly and speak English. It is always good to have someone who knows what fresh fish looks like when you order at a Greek fish restaurant. If in doubt get the grilled sardines, fried gavros, or grilled or fried fresh kalamari and you usually can't go wrong. Further down check out Roka & Rodi which is a very cool burger and pasta restaurant at 31 Fokionos Negri. They have very nice salads and a big selection of appetisers too. They partner with the gelato cafe next door and both places are nice for getting coffee too. Next door is Geia Kalamaki, which is a souvlaki shop/psistaria with lots of inexpensive meat dishes. Walk down another block and you come to Orpheas which is a music bar and restaurant with an international menu. They have live music on weekends, usually rock, jazz or blues. One of my favorite places in Fokionos Negri was Bioletta. It was a Mezedopoleo-Ouzerie that specialized in fish but had a very wide menu and delicious food. 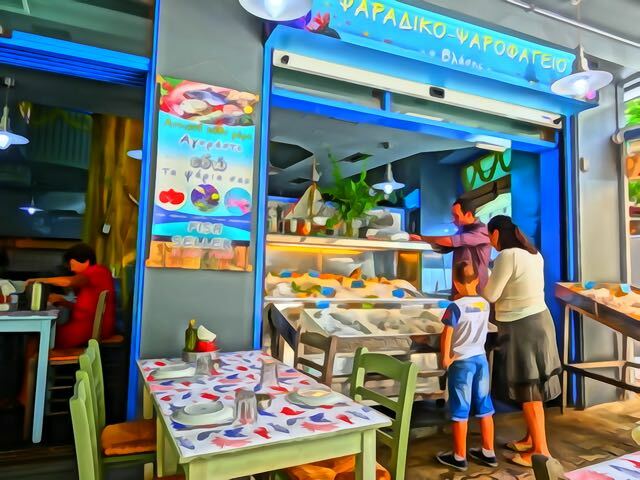 If you are inside you felt like you are in a cozy Greek island fish taverna on a cold day. Outside you could watch the parade of people walking by and enjoy fried gavros, grilled octopus, boiled beets, and so many varieties of fish you would start looking around for the fishing boats. They also had a large selection of grilled steaks, chops and salads. This restaurant had been here since 1961 and it was run by two brothers, one who cooked and the other who waited tables. It was the first Kypseli restaurant to be on my website, probably the first to be on any tourist website. 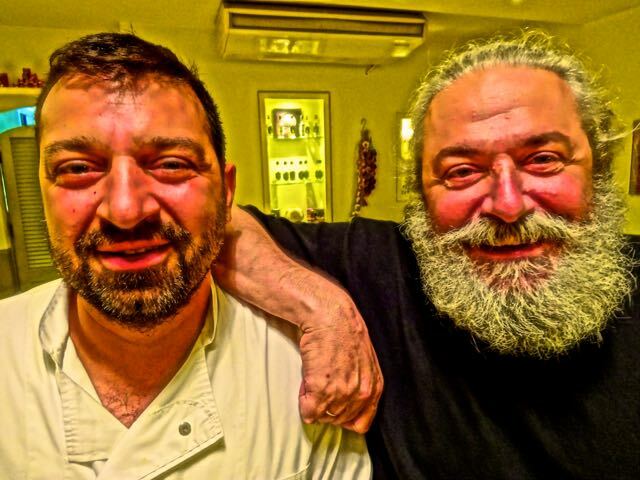 In 2018 one of the brothers, Panagiotis, died and the restaurant closed. But I love this photo so I guess I will keep it up in memory. Another decent restaurant on Fokionos that is similar to Bioletta is called Mezedomaxies. With an emphasis on fresh fish and grilled meats as well as a large selection of salads and mezedes this combination mezedopoulion-estiatorion is a great place to come on a sunny afternoon to have a lingering lunch with some wine, beer, ouzo or tsipuro. (My daughter says this restaurant and Kot-Kot are the best on Fokionos). The people who own Mezedomaxies also own Blasis Fish Restaurant, a souvlaki shop/psistaria called Kypselis Kalamaki, and a sort of tsipuradiko/ouzeri called Pame Tsipuro-Pame Kafeneion or something of that nature. It is not strictly a mezedes place and you can order stuff that looks like it comes from one of the other restaurants they own. It probably does because they are all next door or across the street from each other. 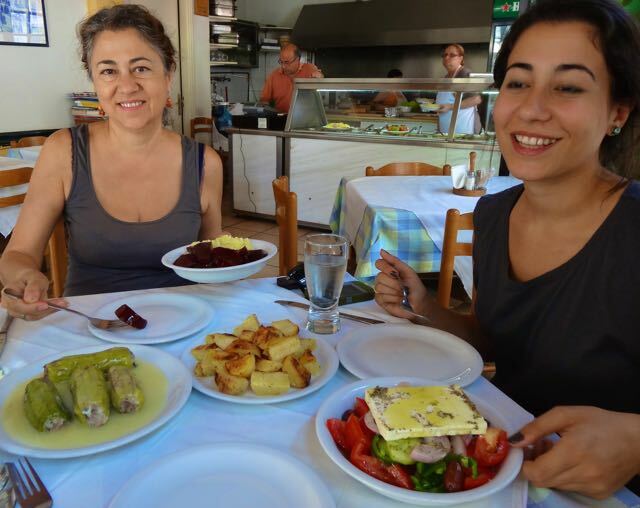 The food is not bad, though slightly formulaic but any of the above restaurants in this family will have better food than just about anything you will find in the Plaka. I came once for a meze and they gave me so many potatoes with my meze I could not even think of having dinner. 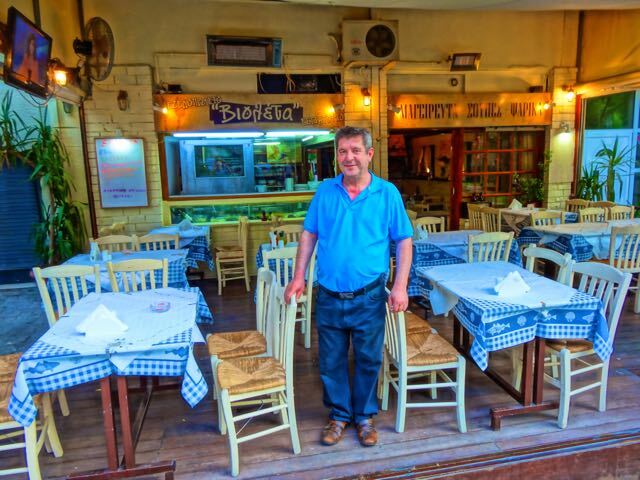 Another good bet is the estiatorio on the corner of Odos Kypselis and Skyrou that is so well known it does not even have a sign that is immediately visible, but it is called H Geitonias (the Neighborhood) and they have excellent food. Like Mary's it is the kind of restaurant you can choose what you want to eat by pointing at it through the glass, though they also have grilled food made to order. It is a typical working class neighborhood restaurant and it is not open at night. But the food is great and the couple who have owned it for ages are very nice too. There is another similar estiatorion called H Myrtia on the corner of Kerkyras and Alitheas Streets. It is one of those places where the clientele are in their 80's and have been eating there since their parents took them there as children. To find it walk down Kypseli Street from the square and turn left and walk past Spetson and the next street is Kerkyras. Go right and it will be on the left side of the street at #34. My favorite place for ouzo and meze in Kypseli was called Rena's on the corner of Skopelos and Spetson street. Named after the beautiful cook and owner who was a long time waitress at Taverna Psiri, she sold it in 2015 and I have been without a favorite ouzeri for the past year or so. It is still there but it is now called Maik and I have yet to try it. My new go-to place for Ouzo and Meze is Bioletta at the very top of Fokionos and above the square. It is a hole-in-the-wall cafeneon, frequented in the daytime by old men who have been coming there for years. But when his father retired, Elias took it over, brought in his pal Alex who had been cooking for private clients in Mykonos villas, and created an ouzeri with great food and really good music too. If you want an authentic experience go here, but not too many of you or you may make it less authentic. Before I discovered Bioletta, Giorgos at Bakalogatos filled in admirably for Rena so that is where I was going since not only does he have a few dozen meze dishes but if I ask him for something particular to go with my mood he will make it. If you want a simple traditional meze go to the old man cafeneon called Kosmikon at the top of Fokionos Negri at Platia Kanaris. But if you want some more fancy ouzo or tsipuro and mezedes go to MPROS at 57 Fokionos Negri, owned by 4 brothers from Serifos who grew up in Belgium. 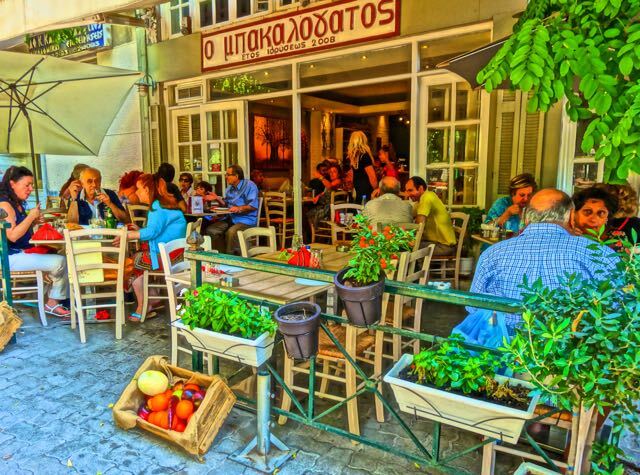 If you walk to the bottom of Fokionos Negri to Patission Street and cross by the deserted Hondos Center building at 15 Agathoupleos Street in a big old house is an ouzeri/mezedopouleion called Tristoixo with lots of ouzos, tsipuros and mezedes and live music which I highly recommend. A little further away though technically still in Kypseli Argiris Argiriou and his father run the popular ouzeri-estiatorio Ippokampos (Seahorse) which serves mostly fish, in fact it feels like you are at a restaurant on the sea if you have a good imagination. They are at 83 Evelpidon, right across the street from the Athens Courts where all their customers come from. For this reason they are open only for lunch, staying open until 5 or as long as there are people there. They are closed weekends. It can be a pretty festive place depending on whether the lawyers and their clients who eat there have won or lost their cases. One of the best, if not the best, places for ouzo and mezedes. 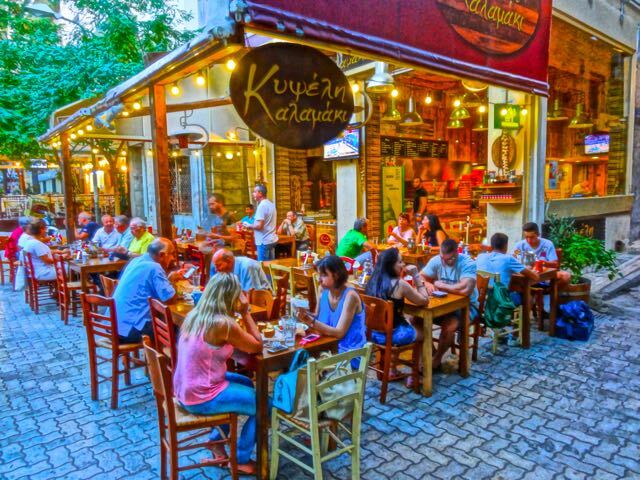 The area around it is a small park so like Fokionos Negri you can eat and drink and not be bothered by Athens traffic. The #15 Trolley from Amalias Ave in front of the National Gardens will take you right there if you get off at the Dikastirion (courts). Also you can get ouzo and meze at any cafe, cafeteria or restaurant on Fokionos Negri. Just ask. And in case I did not mention it before there are 2 cafeneons in the square (Platia Kanaris) at the top of Fokionos Negri where all the old men hang out and they both have ouzo and mezedes. Anyone who loves souvlakia, rotisserie chicken, kokoretsi, kontosouvli, gyros, kalamaki, beefteki, loukaniko, or any other meats that they sell in fast food places, Kypseli has more than its share, and with the slow economy these seem to be where everyone is eating, whether it is to-go or standing only, or an actual sit-down souvlaki shop-psistaria with tablecloths and even wine from the village and a half dozen oven-cooked dishes. You can live on 5 euros a day if you have a tiropita for breakfast, and a souvlaki for lunch or dinner. In fact there are probably a lot of people in the neighborhood who do just that. And almost every restaurant delivers. There is an army of guys on motorcycles bringing take-out from the restaurants to apartments and houses all over Kypseli. 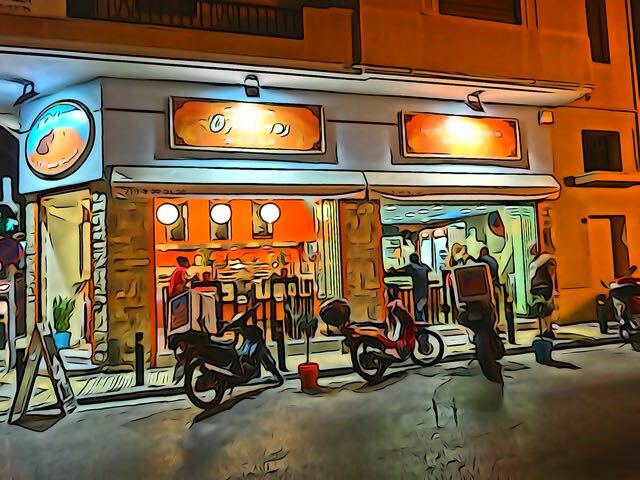 Olympos, the souvlaki shop closest to my apartment is AWESOME. They have about 50 different types of souvlaki, plus kontosouvli, kokoretsi, roast lamb, roast lamb heads!! !, rotisserie chicken and whole grilled chicken, ouzo, wine, tsipuro and magerefta. And it is owned by the butcher shop next door that has the reputation of being the best in the neighborhood! It is at #60 Kypselis Street. Try the Fegaropita which is like a souvlaki quesadilla, stuffed with souvlaki ingredients and grilled so the cheese melts all over it. Haris, the owner, is a former professional soccer player and speaks English. They also have magerefta (oven dishes) and will make paidaikia (lamb chops) and provatina (sheep chops) on the grill. They serve wine and beer and you can get a table on the street and watch the neighborhood go by. At the top of Fokionos Negri on Platia Kanaris (or what they call Kypseli Square) are several psistarias including Kot-Kot, an old taverna with a small dining room and an outdoor area run by Kyria Vasso and her family, which my daughter goes to regularly. This place is like going back in time and the food is really good. Kyria Vasso is in her eighties at least and going strong. Besides grilled meat, they also have magerefta (oven cooked dishes). Then from the bottom of Fokionos to the top of Platia Kanaris there are at least a half dozen other souvlaki shop/psistarias. The best among these is called Rigani, a small souvlaki shop which is at the very bottom of Fokionos Negri which is in the running for best souvlaki in Athens. If you are too poor for even a souvlaki there is good news for you. Right at the Zakynthou bus stop between the Rialto Theater and the Kypseli high school is Mr Euro. Souvlakis cost 1.30 euros and they have outdoor seating at the pedestrian street next to the restaurant. You can get a rotisserie roasted half chicken for 3 euros. If you like coffee then you came to the right place. Fokionos Negri has at least a couple dozen coffee shops that double as bars or triple as cafeterias, which is what they call cafes that serve food and drinks. If good coffee is important to you the best I have had is at SCRY at #34 Fokionos Negri and at Conito which is on Odos Kypseli (Kypseli Street) right across the street from the 15th Lykeio (High School) and the Chuch of Agios Dimitrios. Both places specialize in fresh ground high quality coffee which they advertise proudly. They also serve simple toast and a few things that could pass for breakfast though if you are looking for a hearty meal you may have to sacrifice coffee quality. Right by the old agora on Fokionos Negri is the After Crepe and they have waffles, omelets, crepes and a lot of other things that could pass for breakfast. All the cafes have food of some sort and if your idea of breakfast is some kind of sugary cake then you can go just about anywhere. There are also several big name bakery cafes at the bottom of Fokionos which have all sorts of stuff. Plus if a place does not have anything that appeals to you, be patient and a guy will come around who sells koulouria from his motorcycle and you can have a real Greek breakfast. A couple more of my favorites are The Bee Hive which is across the street from Conito and reminds me of a cafe in an American college town. They have lots of food that is suitable for breakfast, and there is a Thessaloniki style bougatsa place that has lots of pitas and as most people know bougatsa is the perfect breakfast, full of carbs and sugar. 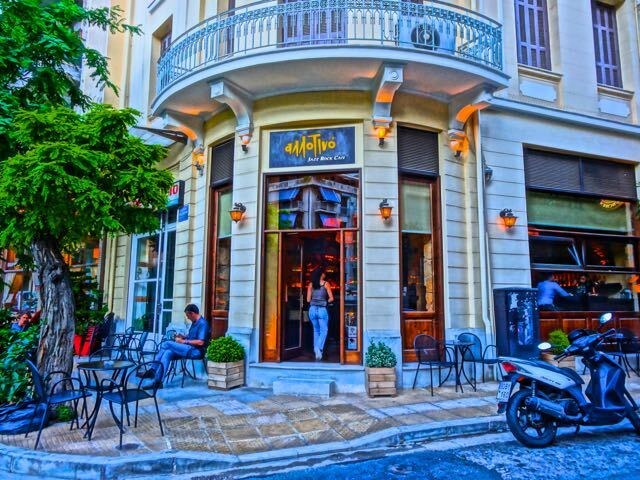 It is at 55 Kypselis Street. 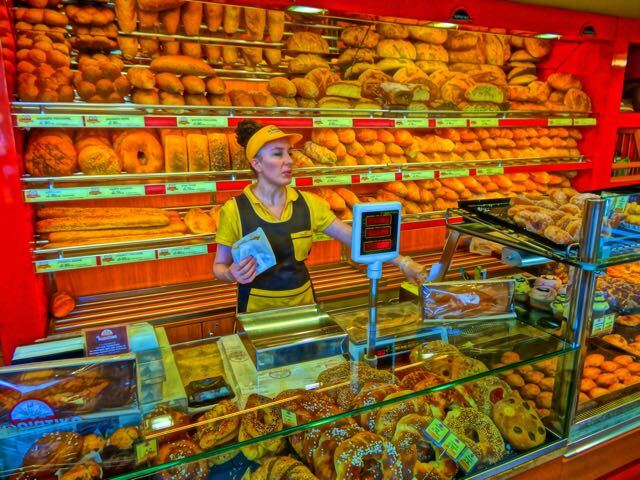 Kypseli must have more bakery-zacharo plastions (sweet shops) than anywhere else in Athens if not the world. At the intersection of Kypselis Street and Agiou Melitiou there are at least five within a block of each other. These shops have amazing looking pastries on display in the window or in glass cases inside and of course they have baklava, kataiffi, tiropitas and spanakopitas of all different shapes and styles. They also have several different breads, from your every day horiatiko (village-style)to dark brown whole wheat of different sizes and textures. Gone are the days when you only had to choose between two types of bread. Now the morning visit to the bakery requires decision making. 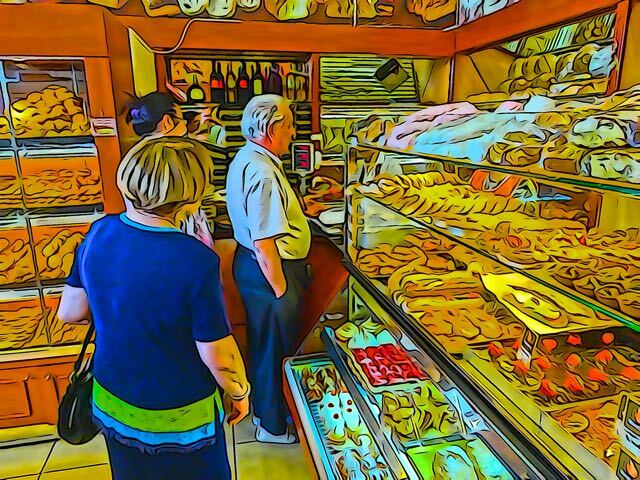 Many of these bakeries are Albanian owned and stay open until 2 or 3 in the morning. Even when they are closed there seems to always be someone working hard in the back and the smell of baking bread and cake fills the air in Kypseli. Several, including one on Agia Zoni still used wood-burning ovens. My friend Anastasia swears by the small bakery of Afoi Mandelou on Hydras street between Spetson and Odos Kypseli. They have wonderful little apple and cherry pies, whole grain breads and loads of cakes, cookies, spanakopitas and pastries. 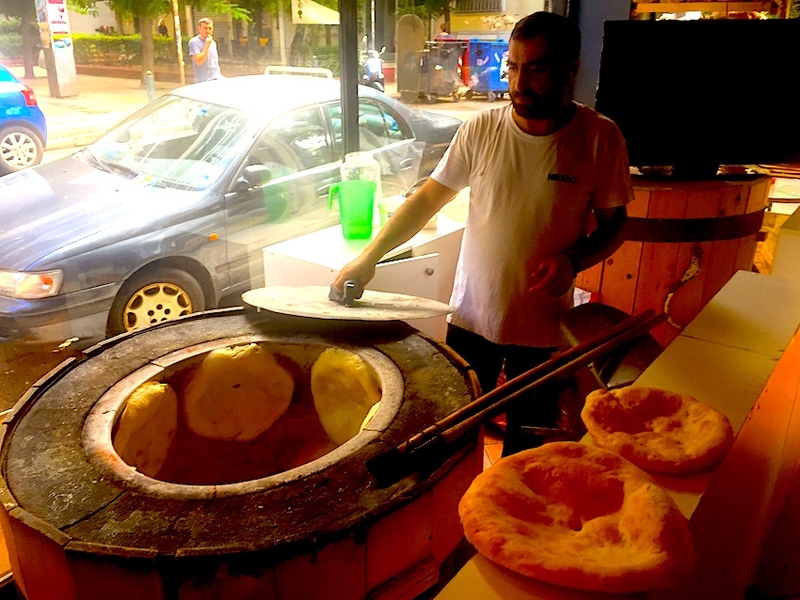 One of the best places to go for breads and pitas made in traditional Georgian style is at the intersection of Fokionos Negri and Ag Zoni. It is called PITA TIS KOLXIDAS it is at #1 Ag Zoni Street. They have a circular stone oven which is lined with the pitas they make somehow adhered to the wall. It is worth coming here to see and their breads and Georgian versions of tiropitas, spanakopitas, kreatopitas are very different from the Greek ones but just as good. They also have potato pirogis, peinerli, and various salads and Georgian style souvlakia so you can come here and have aunique meze or even lunch and dinner. It is easy to find if you are walking up on the left hand side of Fokionos Negri and you turn left on Ag Zoni street and it is in the first building. 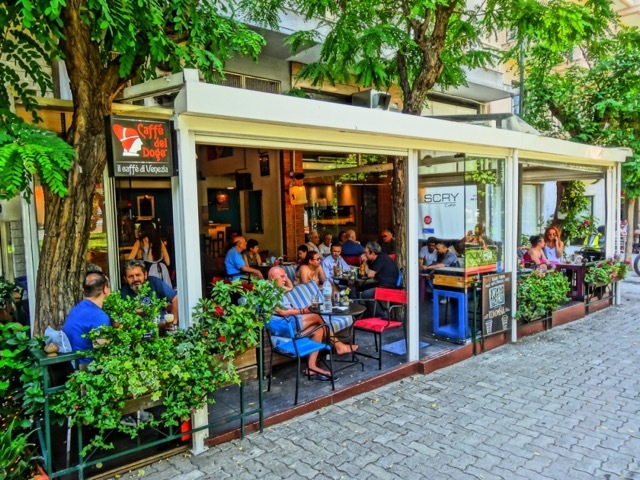 The brightly colored Bardaris at 54 Kypselis Street features bougatsas, tiropitas, spanakopitas and other specialities from Thessaloniki and really only lacks more outdoor seating to be a cool place to hang out and watch the people get off and on the buses. Still I come here for morning coffee and some of the best spanakopitas and tiropitas in Athens, made fresh every morning, and sit at their one table and get to know the neighborhood. A couple doors down on the corner of Zakynthou is a large bakery-zacharoplasteion with a huge selection of baked goods and some of the most amazing pastries you will ever see or eat. And in Platia Georgiou, Skafaidis zacharoplasteon is known throughout Kypseli for their fancy pastries and galatoumbouriko-kataiffi and the amazing seasonal candy displays they create, especially at Easter. I probably don't need to mention that like most cafes in Athens, those on Fokionos Negri have amazing traditional deserts, ice-cream and fancy pastries. And for those with a super sweet tooth will be happy to know that along with the usual Dodoni and Haggan-Das ice-cream shops on the lower part of Fokionos, there is a big Max Perry Chocolate Factory. Kypseli is dotted with ethnic grocery stores that serve the needs of its large African population as well as Albanians, Pakistanis and Russians. Some of these shops carry only a few items and you wonder how they stay in business, but they are supported by the people from the country or village of the shop's owner. They usually stock normal everyday items that you would find in any small grocery store in Athens plus products from their home country and each is somewhat unique. Of course there are a number of small Greek grocery stores like the small fruit and vegetable shop on Zakynthou Street. There is a herb shop, fish market, meat market and other shops within a stone's throw of the Demotiki Agora and scattered throughout Kypseli. The most interesting food shops are the Polish Deli-Pantopoleio (everything store) which have popped up and sell items you might find in your local gourmet store. Kielbasas and various smoked meats and sausages, different types of pickled and smoked herring and other fish, sauerkraut, pickles, soups, frozen pirogis, vodka, Polish beer and hundreds of canned items. My favorite places are the shops that sell nuts like the one at 54 Kypselis street where you can get fresh pistachios, roasted almonds, peanuts, cashews, sunflower and pumpkin seeds and all different kinds of chocolates and liquors. There is also a great 24 hour market at 55 Kypselis Street which reminds me of those Korean markets in New York City. Along with the various ethnic and Greek markets and vegetable shops there are several chain supermarkets in the area. 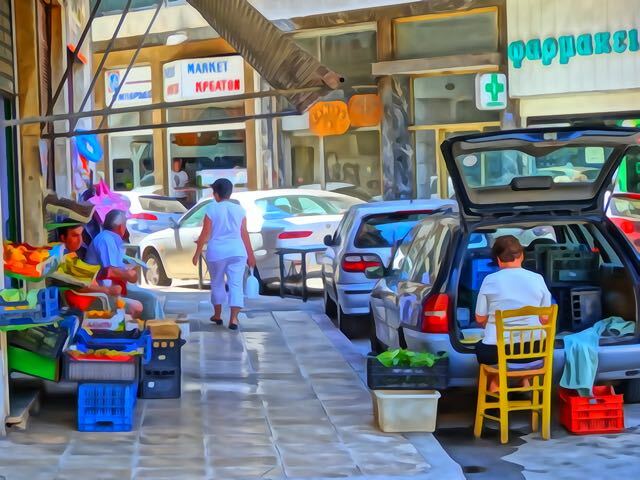 There are also three very large laiki agoras (people's markets or farmer's markets) which go for blocks on different streets on different days of the week. On Thursday the market is on Sporadon and Tinou streets for 4 months and then moves to Hydras street starting at Platia Georgiou for the next four months. On Tuesday the market starts at the top of Fokionos Negri and goes down Lelas Kardiayianni all the way to Patission, and of course on Saturday there is the Organic Market in the Demotiki Agora. Altogether you have plenty of opportunities to buy fresh in season fruits and vegetables, eggs, olives, fish, plants and other edible and non-edible goods if you live in the neighborhood. 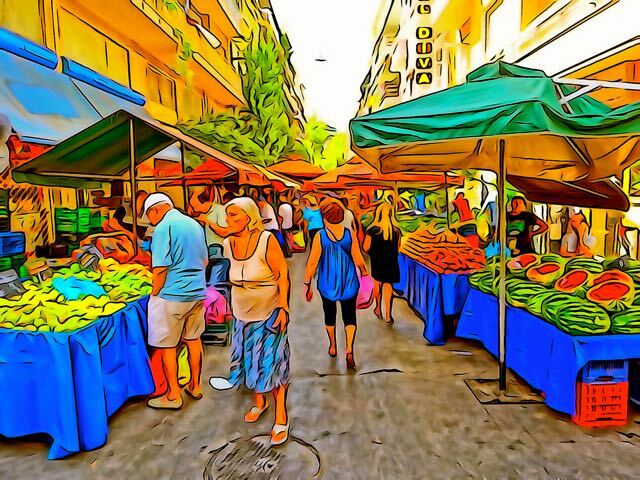 For those who are just visiting Athens these markets are as fine an example of the laiki markets and worth coming to see at any time of year. Fruits and vegetables seem bigger, better and healthier looking than your normal supermarket variety and they are a lot cheaper too. Bargain hunters come at the end when the prices drop because no farmer wants to bring his vegetables back home with him. For those who need to know whether there is a health food store nearby there are several including Miravilis at 42 Sporadon and Natural House which is more of an herb shop at 43. And if you like to buy fresh coffee to make at home there is a Coffee Island in Platia Kanaris. Expats of Kypseli Facebook Group has info on who is playing where in the neighborhood and is a great way to meet other people who live in Kypseli.